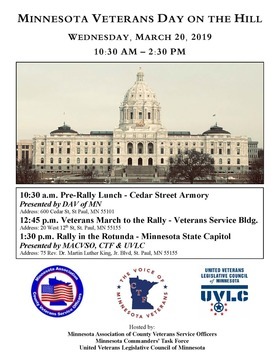 This year's Veterans Day on the Hill rally will take place Wednesday, March 20. This new series at Concordia University, St. Paul is an opportunity for Veterans (and those interested in the war and its legacy) to gather on a monthly basis to honor, remember and understand this tumultuous time. Women Nurses in the Vietnam, March 18, 7 p.m. Reporting on the War, April 15, 7 p.m. The Minnesota Connection to the Battle of Soui Tre, May 20, 7 p.m.
From 11 a.m. – 1 p.m. on March 21, Veterans and their families are invited to an open house at the NW Metro VA Clinic, located at 7545 Veterans Drive, Ramsey, MN 55303. The purpose of the event is to meet clinic staff, ask questions of leadership, tour the facility and enjoy refreshments. 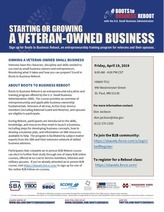 Leadership from the Minneapolis VA will attend. All ages, eras, transitioning military Women are welcome to the 2019 MDVA Women Veterans Conference at the YMCA Maplewood Community Center. There will be a Veterans Benefit Bonanza for Veterans, current military, retirees, and their spouses/dependents on Thursday, March 28, from 11 a.m. to 6 p.m. 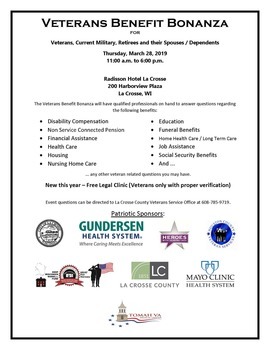 This event will be at the Radisson Hotel in La Crosse, WI. 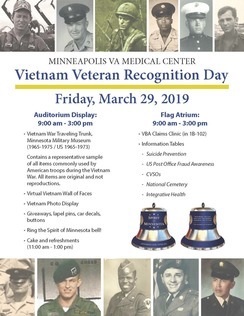 Vietnam Veterans are invited to attend the Vietnam Veteran Recognition event on Friday, March 29, from 9 a.m. – 3 p.m., at the Minneapolis VA Medical Center. Forest Lake American Legion Post # 225 will be hosting Vietnam Veterans Day March 31, with a ceremony begining at 2 p.m. featuring KLBB radio host, and Veteran KSTP news anchor Stan Turner as the Master of Ceremony. Military Order of the Purple Heart (MOPH) advocates for “ALL” Veterans and their families to secure the benefits that have been earned from service. MOPH will also continue to advocate for all Veterans claims and the invisible wounds. Through our Service Program, MOPH assists about 135,000 Veterans a year by filing claims for the benefits available to them. You do not need to be a member of the Order to seek assistance. 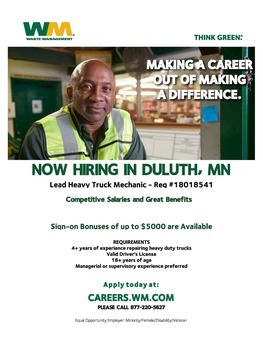 Waste Management is in need of filling the position of a Lead Diesel Technician/Mechanic in Duluth, MN, which offers a $5,000 Sign-on Bonus, as well as relocation assistance. Waste Management has found Veterans to be a great fit in their organization, with one in twelve current employees being former military. Waste Management encourages any and all qualified Veteran’s to apply online here. 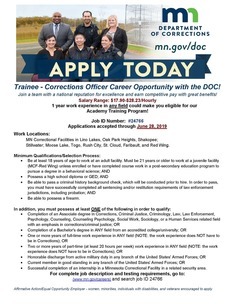 The Minnesota Department of Corrections encourages Veterans to apply for Corrections Officer career opportunities! Locations include Lino Lakes, Oak Park Heights, Shakopee, Stillwater, Moose Lake, Togo, Rush City, St. Cloud, Faribault, and Red Wing. Applications accepted through June 28. The Minnesota Air Force Association General E.W. Rawlings Chapter will be hosting their annual awards dinner at the Town & Country Club on Friday, April 5, from 6 to 9:45 p.m.
Dinner entrée choice is Chicken breast or Walleye or Tossed Vegetable Pasta. Gluten-free can be arranged. Isanti County will be honoring the sacrifices of all Purple Heart recipients during the Isanti County Board Meeting on April 17, 2019, which begins at 9 a.m. A proclamation will be signed by Mike Warring, Board Chair, designating Isanti County as a Purple Heart County. All are invited to attend and show their appreciation for the sacrifices made by Purple Heart recipients defending our freedoms. Join our dedicated team! 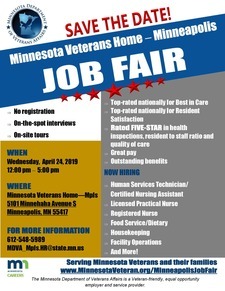 The Minnesota Veterans Home – Minneapolis will be hosting an on-site job fair Wednesday, April 24. There will be opportunities to apply, tour the facility, and be interviewed on-the-spot. Human resources representatives and hiring supervisors will be on-site to discuss job opportunities, and to learn more about you and your qualifications. There will also be many activities happening throughout the day! The Military Order of the Purple Heart will be hosting Heroes Among Us at Rochester VFW Post #1215. 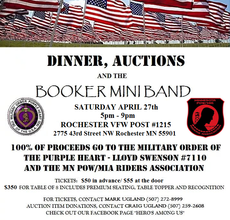 100% of the proceeds go to the Military Order of the Purple Heart - Lloyd Swenson #7110 and the MN POW/MIA Riders Association. EAGAN, Minn. — The Department of Veterans Affairs (VA) is pleased to announce the appointment of Dr. John A. Smyrski III as the new Chief Medical Officer of the VA Midwest Health Care Network. He will begin work at the network on April 29, 2019. Dr. Smyrski has over 33 years of clinical, operational and strategic leadership experience in healthcare delivery, research, acquisition, and human resources. He earned a Bachelor of Science degree in Natural Science from Saint John’s University, Collegeville, MN. A Distinguished Military Graduate, he received a Regular Army commission as a Second Lieutenant in the Aviation Branch. Most recently, he served as Chief, Health Services Division, US Army Human Resources Command at Fort Knox, KY. Dr. Smyrski holds a Doctor of Medicine degree from Uniformed Services University, a Master of Public Health degree from The University of Alabama at Birmingham, a Master of Business Administration degree from Troy University, and a Master of Strategic Studies degree from the US Army War College. Dr. Smyrski is a Fellow, Aerospace Medical Association, a member of the Army Aviation Association of America’s (AAAA) Order of Saint Michael (Bronze and Silver Awards) and the Army Medical Department’s Order of Military Medical Merit. He is a member of Delta Omega Honorary Society in Public Health and Society of US Army Flight Surgeons Order of Aeromedical Merit. He also holds the prestigious Army Medical Department “A” Proficiency Designator and is a two time recipient (2004, 2014) of the AAAA Aviation Medicine Award for Army Flight Surgeon of the Year. The VA Midwest Health Care Network serves more than 440,000 enrolled Veterans residing in the states of Iowa, Minnesota, Nebraska, North Dakota, South Dakota and portions of Illinois, Kansas, Missouri, Wisconsin and Wyoming. Health care services are delivered through an integrated system of 9 hospitals, 69 community based outpatient or outreach clinics, 8 community living centers and 4 domiciliary residential rehabilitation treatment programs.